I was visiting my chums at the Wine & Cheese Cask in Somerville, MA last week to pick up a number of wines from their most recent newsletter. One of the wines, the 2010 Clos de la Roilette Cuvée Tardive piqued my interest, largely because in the brief description, reference was made to the “2009 regular bottling” being both outstanding and, more importantly – still available. Sure, enough the 2009 regular bottling was in the store, so I picked some up to try. Needless to say, the wine is fantastic and at $19.99 per bottle, a respectable value. Yet another 2009 Beaujolais that is just stunning. Ripe nose with fresh cherry, lilac and wildflower hints. Medium-bodied with moderate acidity and smooth, supple tannin – good balance. Fruity palate with black cherry, plum and tar notes – lush. Moderate length – quaffable. Drinking well now and should hold for another 2 to 3 years in bottle. Corbières is a French wine region located below the southern Rhone valley in an area called Languedoc Roussillon. The sun-splashed vineyards produce ripe grapes that create wines that are lush and quaffable, which in really good vintages have structure and balance to rival their cousins in the Rhone. Domaine Sainte-Eugénie is located in the heart of the region in an area called Fontfroide and has a wine making tradition going back over 800 years. The soils in the vineyards are primarily clay and chalk, largely due to their proximity to the Pyrénées Mountains. The dry, sunny and warm Mediterranean climate provides near-perfect growing conditions for the blend of Carignan (50%), Grenache (25%) and Syrah (25%) that make up this wine. I only just started following this producer in 2005, but the two successive vintages I have tasted, 2007 and 2009 have been tremendous. 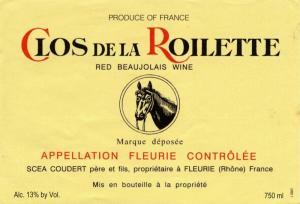 At an average price of $9.99 per bottle, clearly this is another southern French producer I will be adding to my list. Spicy, earthy nose with fresh herb, black cherry and violet hints. Medium-to-full-bodied with moderate acidity and supple, well-integrated tannin – good balance. Dark cherry palate with cocoa, rosemary and tarry notes. Moderate length, smooth and seductive with echoing spice and violets off the nose. Drinking well now and should hold for another 2 to 3 years in bottle. Great Value! I love a good story, even better when the story is told about a fantastic cocktail! The French 75 is also a cocktail not without some controversy. The recipe in Craddock’s book records gin as the cocktail’s base spirit, to which one adds lemon juice, sugar and then Champagne to finish up. In David Embury’s The Fine Art of Mixing Drinks (1948), one of my favorite cocktail guides, the base spirit is listed as Cognac. Much more French, I’d say, but with a decidedly heavier presence. I’ve tried both versions and think they are just wonderful in their own way. The gin-based version has a lively palate that is refreshing and tart with a complex nose from the botanicals of the gin (I chose Tanqueray 10 as the base). The Cognac-based version has more depth and body with pleasing hints of vanilla and caramel – almost like a Sidecar with bubbles… In any event, the cocktail is visually striking and a fine way to awaken one’s spirit after a long day in the trenches! Vigorously shake the gin, sugar and lemon juice with crushed ice. Strain into a Champagne flute and top off with Brut Champagne. Garnish with a twist is optional. I just finished a superb book on the subject of bitters and I cannot give it a high-enough recommendation. 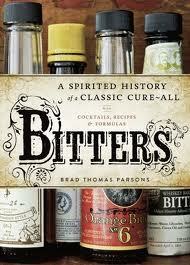 If you are an avid mixologist and classic cocktail aficionado like me, then the volume Bitters: A Spirited History of a Classic Cure-All, with Cocktails, Recipes, and Formulas by Brad Thomas Parsons, is a must have for your library. Parsons takes his reader on a exciting journey through the history of bitters, chronicling the heady pre-prohibition days when literally hundreds of varieties of bitters were available to the everyday barman; the dark days of prohibition when bitters almost went the way of the dodo; and the current resurgence of the bitters “cult” as the proverbial wingman to the classic cocktail revolution. Parson’s style is engaging and his humor is dry and lightly satiric. His story-telling ability keeps what could be a fairly dry topic quite entertaining. I’m already planning a trip to find a few pints of Everclear, as well as a local herbal center to find cinchona bark and a few other odd roots to begin fabrication of my own craft bitters!